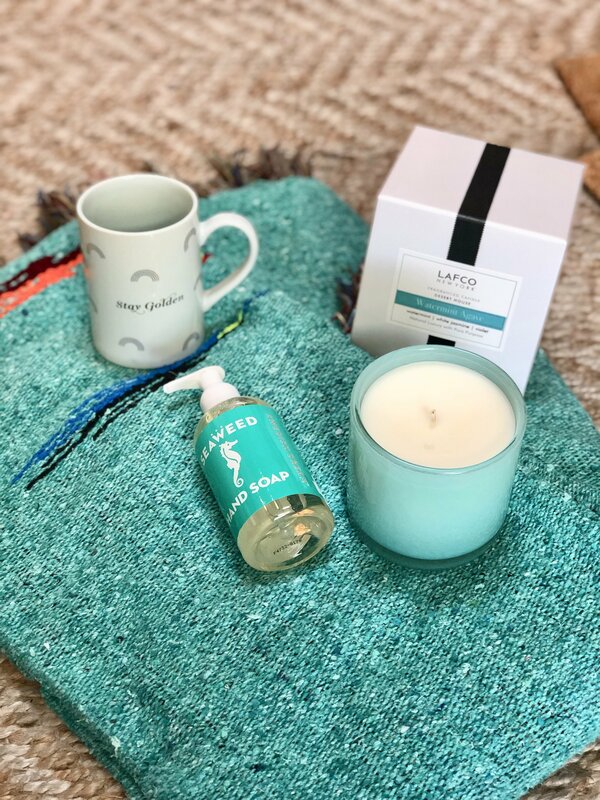 Stay Golden mug $15, Lafco’s newest scent, Watermint Agave $65, Seaweed Soap $12, Cotton Mexican blanket $46. 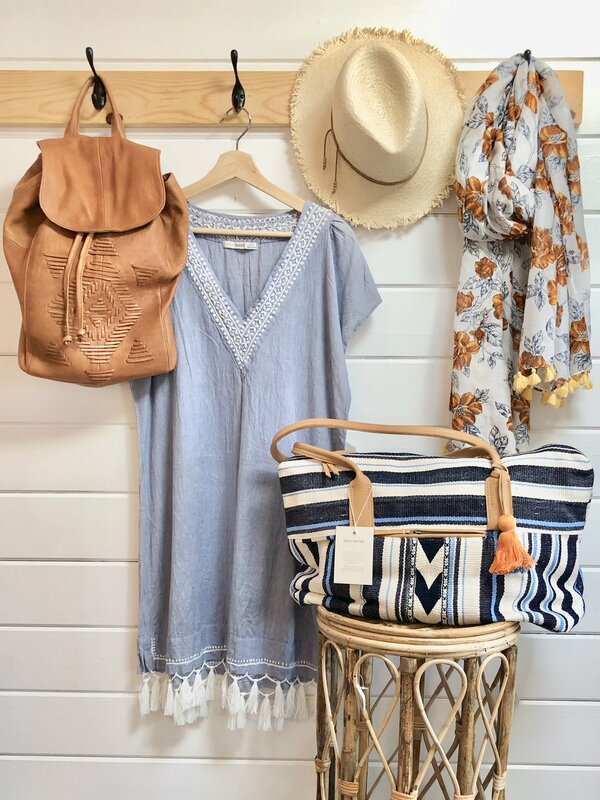 A leather backpack is a great travel staple, $268, Chambray embroidered beach dress $110, Fringed Hat Attack hat $100, Lightweight scarf/pareo $64, Hand Woven weekend duffel bag $207, Bamboo Side Table $96. 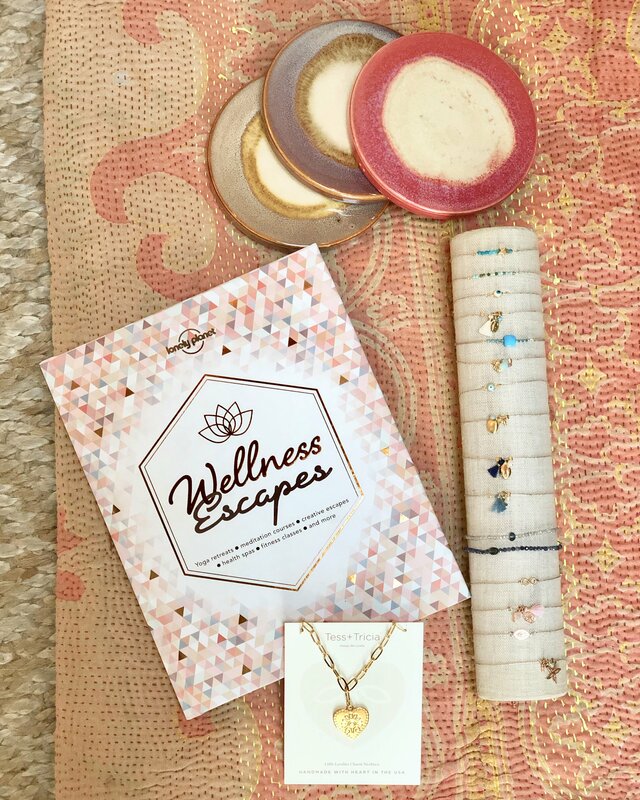 Pretty ceramic coasters for all those guests coming over for cocktails $12 each, All new bracelets from our favorite Sophie Deschamps $18-$34, Tess + Tricia Heart Necklace $64, Wellness Escapes $17.99, Vintage Kantha blanket $92. 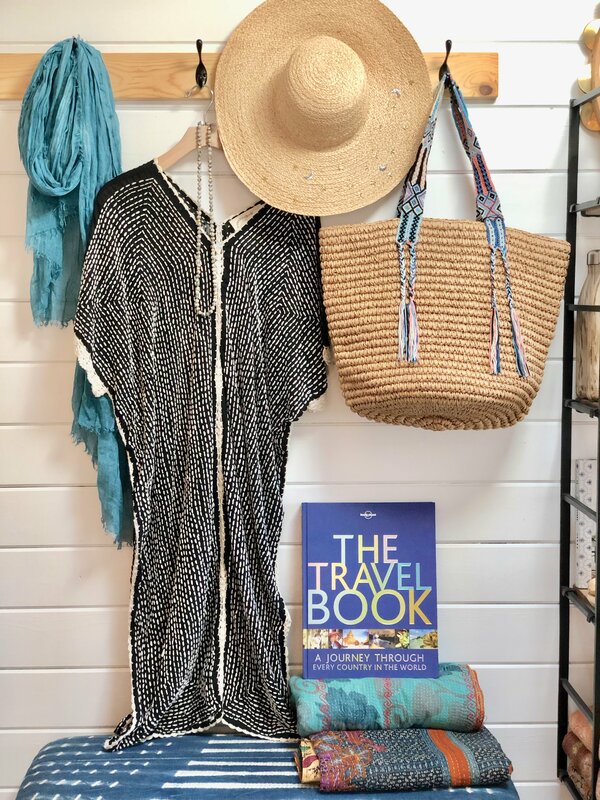 Beautiful leather tote from socially conscious brand Able $188, Gray onyx tassel necklace from Chan Luu $221, the perfect modern cowboy hat $104, Beach pants $83, Chan Luu neck scarf, looks super cute in a pony tail too $35, and my new favorite item in the shop, this gorgeous gigantic straw tote $138. I’ll be taking all of this home…. 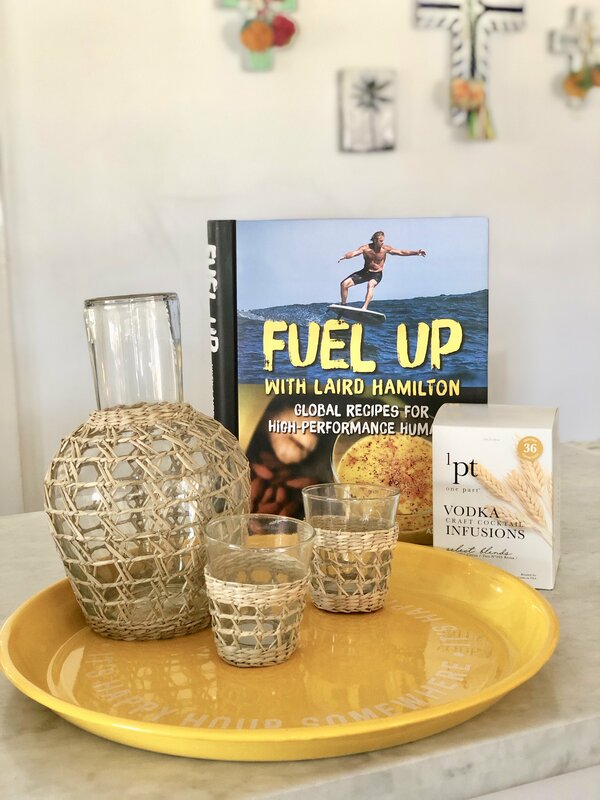 Fuel Up cookbook from Laird Hamilton $50, Vodka craft cocktail infusions, these are amazing, 3 different blends to infuse your vodka with flavor! $34, Sunny yellow “it’s happy hour somewhere” bar tray $37, Glass and cane pitcher $35 and glasses $12 each. 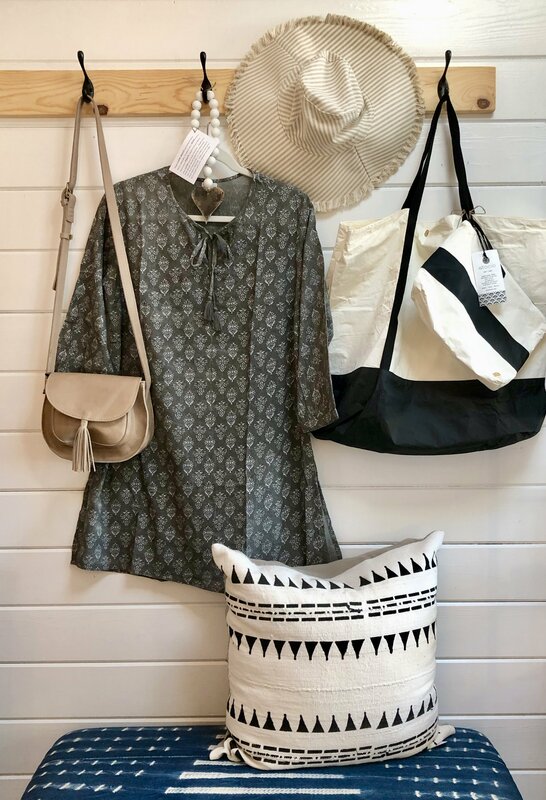 The color of this little cross body bag from Able is so good $148, Gray cotton tunic $32, Mini love beads $52, Stripped sunhat $58, This big BAG…it’s made of super strong Tyvek, has 2 interior compartments, is waterproof, and folds up to fit in the little clutch attached, travel perfection $98, and of course the beautiful pillow $164. 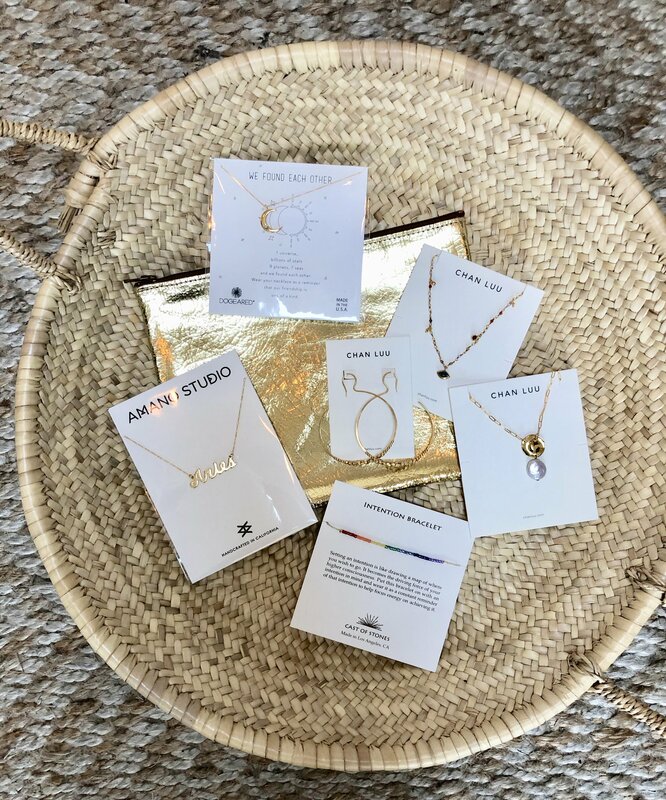 Moroccan basket $38, Gold leather Tracey Tanner pouch $64, Dogeared moon necklace $68, Chan Luu semi precious stone and turquoise eye necklace $179, Chan Luu pearl necklace $106, Chan Luu beaded hoops $133, Intention bracelet $21, Aries horoscope necklace $28. How cute is this straw backpack?! 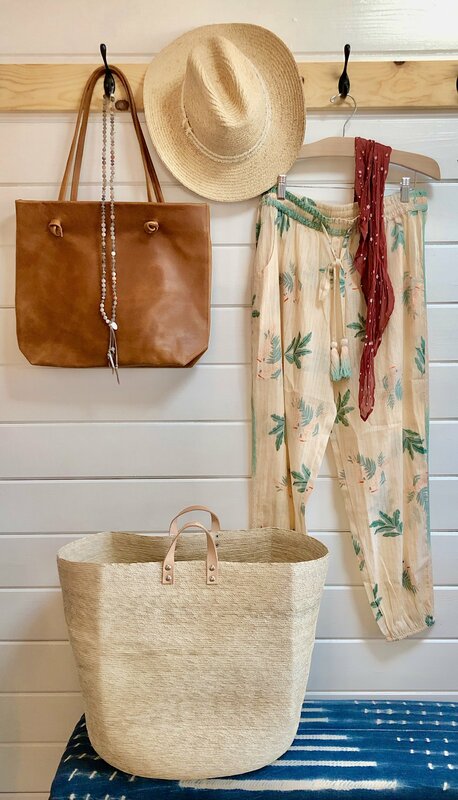 Can also be carried as a tote $86, Love the straw visor $96, and the beautiful cover up $64. 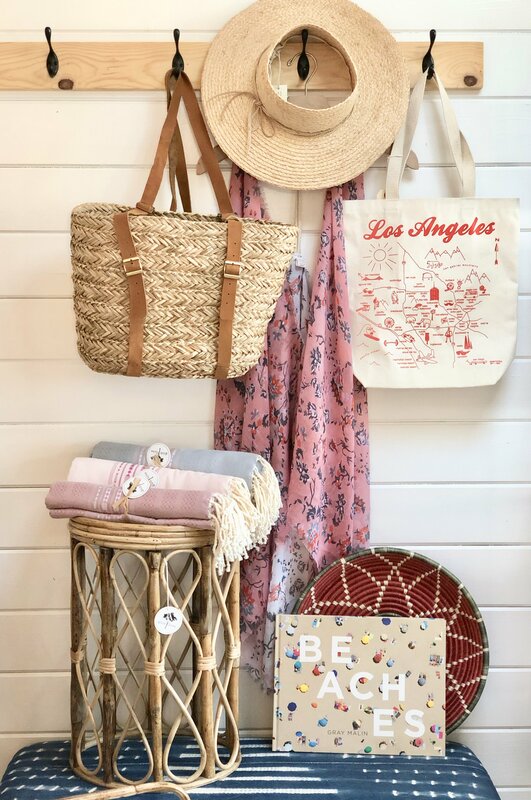 Our Map Tote LA market bag is a great gift to take to out of town hosts $26, Rust colored African Basket $92, Beaches from Gray Malin is still a favorite coffee table book $40, that little bamboo table again $96, and some beautiful Turkish Towels $36 each. Whether your headed for spring break, or having a staycation, we’ve got you covered.